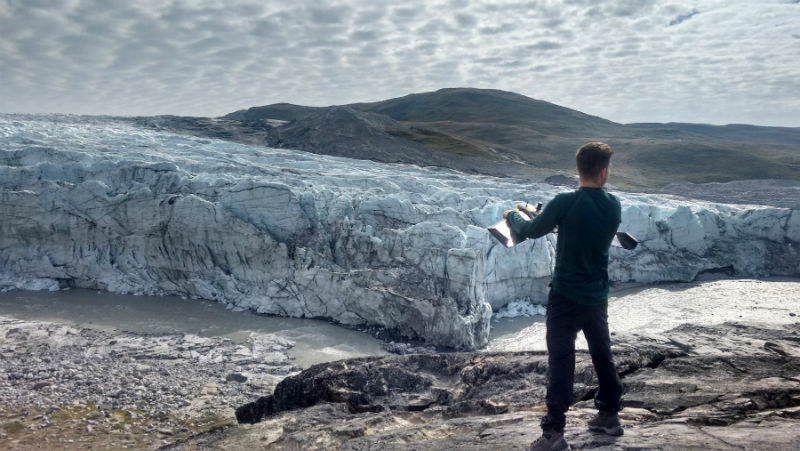 The University of Exeter’s Interactive Virtual Environments for Teaching and Assessment – InVEnTA – uses the latest advances in 3D imaging to take students and researchers to environments from the sunny climes of Devon to the Arctic Circle and beyond. The project has been nominated for an international award at the Reimagine Education Conference in San Francisco, held from November 29-30. The team behind InVEnTA is Dr Steven Palmer, Dr Damien Mansell and Dr Anne Le Brocq, all senior lecturers in physical geography in the University of Exeter’s College of Life and Environmental Sciences. They are being supported by the University of Exeter Education Incubator. Dr Palmer said: “Over the past year we’ve been looking into the practicality of using the latest 3D visualisation techniques, which will be very familiar to many computer gamers, to take students on virtual field trips almost anywhere in the world. “Instead of controlling weapons in a shoot ’em up game, students can control where they go in the virtual environment. It helps people visualise what is happening and understand the processes under way. This is also useful for scientific research, as well as teaching. Dr Palmer added: “At the moment we are focusing on understanding the value of the tool in a university undergraduate teaching environment. “The support from the Education Incubator has been invaluable. It provided initial funding for the first year, which helped us get to this stage, and now its continuing support means we hope to be able to make further progress towards taking the tool into the classroom. To read more about the incubator please click here.